Charlie and a Dance to the End of Time. Charlie Trevellion wakes with a start. There is a moment of panic as he hauls his aching, fifty year old limbs, upright. He almost falls from his bunk in his haste to get to the porthole, naked, and stepping on the previous day’s discarded clothes. The sudden movement inside causes his small, wooden, sailing cruiser, The White Doe, to rock gently, sending ripples across the anchorage. Charlie also rocks gently with relief as he looks out and remembers where he is. However, as his memory begins to function, the relief is overshadowed by the recollection of why he’s here. Then just as he is about to collapse back on to his bunk, with its crumpled sleeping bag, he catches sight of her, framed in the circular brass porthole. Standing before him, a vision in white on the foreshore, she is poised on one leg, ankle deep in a pool of seawater. Her other leg is bent at the knee. One golden yellow foot is raised, like a ballerina, frozen in the act of tiptoeing. She is gazing down, through the unbroken reflection of the dawn sky, alone and still. Her long slender black stockinged legs are delicate and pure, save where an emerald pennant of seaweed trails. Charlie is frozen in empathy with the intensity of her stillness. The secret song of her beauty slips covertly and silently through his eyes. She seems like one touched by magic; surrounded as she is by the crystalline beds of wet sand sparkling in the slanting sun. Her dainty figure has the appearance of an innocent returning from a sophisticated all night party, with her elegant long neck, long feathery plume on her head and lacy white frill fluttering on her breast. His existence, his being, stands still in wonder, delight and rapture. The moment becomes eternity and eternity the moment. ‘Ah, Isolt, loveliness personified. A wild angel of mortal youth and beauty an envoy from the fair courts of life,’ he breaths. Charlie had woken from a deep exhausted slumber. Yesterday’s sail, along the North Brittany coast, had been slow and tedious. 'Like Tristan, drifting in his rudderless boat,' he said to himself. He had been headed for L’Aber Wrac’h a familiar anchorage further along the coast. However, the combination of strong tides, light winds and a reluctance to use his engine, meant that it took him most of the day to cover the twenty miles from Roscroff. He had moored there the previous evening but hadn’t slept well, despite being tired. The noise and bright lights from the touristy town in August, and his mind’s increasing unease at his pointless nice little life, conspired to keep him awake. So, yesterday, when the tide began to turn against him again, he decided to head for the nearest refuge. He had anchored, in this deep pool, behind a large outcrop of pink granite topped with short dry sea grass and a clump of, wind blown, gorse. Now, that the tide had retreated, it was flanked by drying sands and pools of stranded seawater on one side and the channel leading to Brignogan Plage on the other. 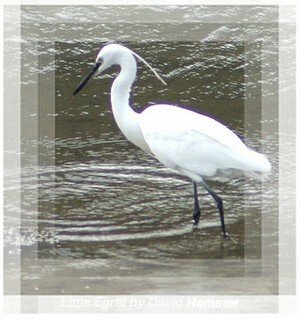 For now this chance encounter with ‘Isolt‘, a little egret, has momentarily lifted his mind above his discontent; his vague wish for escape to some tropical Lake Isle of Inishfree with a bee loud glade, to the land where corrals grow, anywhere away from this feeling that his life had become futile. For the moment he feels unheeded, happy and near to the wild heart of life. The early morning sunshine sparkling on the wet sands and flashing off the rippling water is reflecting on the deck above his head which, is already beginning to warm. He is just reaching, with the familiarity of practice, for his coffee pot, without taking his eye from the still figure of Isolt, when suddenly the egret’s head darts forward. The long tapered beak jabs through the mirrored surface. The sunlight splinters, shards of flying crystal fill the air, as she lifts aloft an eel; a black wriggling ribbon of high tensile sprung steel. Wings stretched to balance, plumes fluttering, feet shuffle, as a pas de deux with her reluctant partner begins. Expertly she tosses her prize in her beak and drops him head first down the dark tunnel of her gullet. ‘Ha, Tantris upturned,’ gasps Charlie, the coffee forgotten. However, this wriggling, squirming prize is hard to swallow, his head is already well down her throat, but his back end is still thrashing the air. With a demonic whiplash the dark, creature of the undersea flings himself skywards then drops still thrashing back into the warm bath of the pool. The ballerina again freezes in mid step peering down as the shattered surface stills, the sand settles and the ripples spend themselves on the rim of the pool. No sounds cross to Charlie even though the ballet is performed just a few yards from his spy hole. ‘The still point of the turning world, except for the still point there would be no dance, there is only the dance,’ thinks Charlie, misquoting Elliot, as he catches his breath. A crab scuttles sideways over the edge of the pool. His blushing carapace low to ground claws tucked in, he makes for the nearest rock. His yellow legs scrabble at the sand as he digs a hole from which, to watch with beady eyes. The sight of the crab reminds Charlie, of his entry, into his bolthole, the evening before. He only had very sketchy information on this little used inlet. Nevertheless, closing with the coast he was able to pick out the marker buoy at the entrance to the channel. This lead from the translucent, calm blue water of open sea between large pink granite boulders with a mortar of contrasting creamy white sand between. Going with his instincts but consciously fearful of the outcome he dropped his sails and turned on Bessie, his trusty old engine, then turned in towards the channel. There was a tricky moment, as the tide was setting across the entrance. Once in, the early evening sun cast deep shadows on his right hand side as he threaded his way among the rocks. The darker blue of the deeper water however, was easy to pick out against the sandy shallows. It was a pleasant surprise to be able to easily make it through, accompanied by the popple of the engine echoing from the rocks and the scent of the dry sea grasses, gorse and drying seaweed. Once inside the inlet opened out into a small bay where a few local fishing vessels were moored. At the end, several small boats drawn up on the beach and the few scattered buildings of Brogan Plage provided splashes of colour among the low bushes. As he dropped the anchor, a faint aroma of cooking drifting from the village reminded him of his own hunger. He slopped a couple of tins of Sainsbury’s stew into a pan, to warm on the galley stove while he tidied the sails and checked that his anchor was holding. The faded ‘Jolly Roger’ and the ‘My Little Mermaid’ pennant, hung limply at the top of the mast. Burning his mouth, he managed to eat half the stew straight from the pan. Then, he collapsed on to his bunk, just as the odd light began to appear on shore and 'Mintaka', the jewel in Orion’s belt became visible in the darkening sky above the rocks to the east. The quiet was a welcome contrast to the crowded anchorage and the noise and bright lights of Roscroff the previous evening. Now, in the early morning light, there is no sign of movement on shore, and only the faint hiss of the old unquiet ocean beyond the rocks to disturb the stillness. Then, suddenly, swiftly, the slim black harpoon of the egrets beak strikes down. Again, the eel, stranded in the pool by the receding tide, is dragged out into the upper world of light and air. Once again, the pas de deux for survival begins. The eel fighting for his own, egret for the survival of her chicks left behind in the nest, with her partner. Once again, the little egret tosses the eel into her gullet. Once again her throat seems to belong, not to her, but to become a second skin for the squirming front end of the eel. Again, the eel’s slime, a protection from the changing salinity, helps him escape the dark, cloying warmth. Charlie gasps, unsure if he is relieved for the eel or grieving for the egret. Again, the somersaulting eel plops into the shrinking pool. Once more, there is a pause, the egret stills, watching, unwilling to discharge her reluctant lover. Charlie was probably being too ambitious when he set off on this, his first real offshore trip alone. His usual crew, Laura his wife and Craig and Sarah their two children were off doing their own things now. Charlie had been taken by surprise by Laura’s announcement that she was going on holiday to Croatia with her friend Sibyl. ‘By the time you make up your mind where you want to go the summer will be over.‘ Laura had retorted. Two weeks with Sibyl, her huge hats, huge bottom, and even larger voice, sounded to Charlie like a fate worse than death. However, he had regretted his procrastination later when, he discovered that their itinerary took in Diocletian’s Palace. He could almost picture himself finally, reading his copy of Gibbon’s Decline and Fall, whilst sitting among the ruins. He had carried it around Rome a couple of years ago but still hadn’t opened it. So finding himself with two weeks on his own and no plans, his need for some sort of fulfilment, some purpose, took him down to the old family cruiser moored on the Itchen. Without any real goal, he took her out into the channel and headed across the hundred and fifty odd miles of open sea from Plymouth to Roscroff. It was an anxious crossing watching out for shipping, while the ‘Kraken’ of his discontent slumbered below the surface. Now, a fly, woken by the morning sun, buzzes through the open hatch bringing Charlie back to the present. Just in time, to see the egret once again strike down with the harpoon of her beak. With an explosion of spray, she flicks the indignant eel back up into the air. Shock waves convulse his quicksilver body preventing the egret from gaining a proper hold. Tiring now, she cannot maneuver him into a swallowing position. She flutters her wings and virtually does an entrechat, but, finally she loses him once again. Then, just as Charlie thinks she is about to continue the dance, she starts, a quick bend of the knees a flash of white wing and she is gone. The eel, gaining his freedom, squirms low in the sand to await the returning tide. Charlie, the spell broken, looks around to see what has disturbed the egret. He sees movement on the periphery of his circular view. It’s a dog weaving his absorbed way across the sands. ‘Hail, Dagonet the king of fools,’ exults Charlie, relived to return to the everyday, the mundane world. The dog sniffs a rock, lifts his hind leg, quickly pisses at it, lollops, dawdles, smells another stone. Pisses at an un-smelt clump of seaweed, then scrabbles at the sand. It’s one of those nondescript part setter but mostly something else dogs. Its reddish brown short hair is sand and salt encrusted. Large paws flip-flop at the end of long ungainly legs, scattering the sand. This Don Quixote of the canine world sports a red and once white kerchief tied around his neck, a token perhaps of his fealty to his Dulcinea. His’ wet ears flap as he tilts at another outcrop. The entrance of the dog coincides with the burble of Charlie’s coffee pot. The aroma of fresh coffee mixes with the familiar smell of wood oil creosote and salt encrusted ropes within the cabin. Remembering to slip on a pair of grubby, blue shorts, Charlie takes his coffee out to the warm sunshine of the cockpit. Brogannan Plage is beginning to wake up; a door slams, someone is moving among the misty houses. The mirror surface of the inlet breaks up as the gorse, above on the rock rattles. There is a sussing in the dry grass as the breeze and the tide gently return. A pair of gulls squabble over some titbit. Laughing at the dog as he paddles shoreward through the puddles, Charlie feels almost happy. Suddenly the thought of his own home seems overwhelmingly inviting. For now, the sunshine and the coffee are very pleasant. But the thought of puttering under the Itchen Bridge, picking up White Doe’s mooring, then walking up the hill to that nice little house in Saltash begins to seem like a purpose worth pursuing.